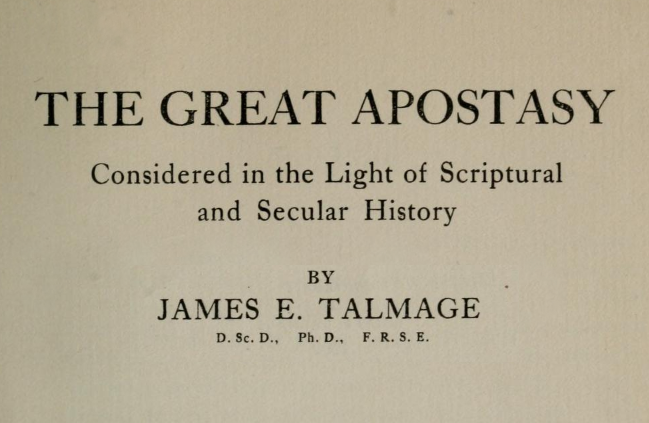 I just finished reading The Great Apostasy by Dr. James Edward Talmage. Despite the fact that he was a president of the University of Utah, thus a Ute fan, his 102 year-old book still fills a dark room with brilliant light. Check out its PDF, scanned from the stacks at Brigham Young University (go Cougars!) at http://is.gd/iRzImq. The Great Apostasy does a thorough job of explaining how God’s children repeatedly enter into periods of apostasy and abandon what they once knew to be true in favor of that which is false. It also explains how the Church established by Jesus fell into its prophesied apostasy and lost its authority to act in the name of God, and how it was eventually restored to earth again. A few years after writing this book, Talmage was called by Joseph F. Smith to serve as a member of the Quorum of the Twelve Apostles in the Church of Jesus Christ of Latter-day Saints. He served in this capacity until his death in 1933. In my opinion, Talmage was one of the leading LDS scholars of his day and one of its chief apologists. He was one of the first individuals to clearly and cogently explain the Church’s doctrines, tenets, and teachings to members and nonmembers alike. He was also the author of such noteworthy books as The Articles of Faith, The House of the Lord, and Jesus the Christ. When I was a missionary back in 1985–1987, these books were the only approved supplements to the scriptures which LDS missionaries were permitted to study. These books inspired me spiritually and challenged me intellectually. The Apostasy Predicted. The Church has not continued in unbroken succession. — Divine foreknowledge. — The divine purposes not thwarted. — Apostasy from the Church compared with the apostasy of the Church. — Specific predictions concerning the apostasy. — The Law of Moses a temporary measure. — Isaiah’s fateful prophecy. — Predictions by Jesus Christ. — By Paul. — By Peter. — By Jude. — By John the Revelator. — Apostasy on the western hemisphere predicted. Early Stages of the Apostasy. The apostasy recognized in apostolic age. — Testimony of Paul. — “Mystery of iniquity.” — Summary of Paul’s utterances concerning early apostasy. — Testimony of Jude. — Of John the Revelator. — Messages to the churches of Asia. — Nicolaitanes denounced. — Testimony of Hegesippus. — Early schisms in the Church. — Declension of the Church before close of first century. — Apostasy on the western hemisphere. — Destruction of Nephite nation by the Lamanites. Causes of the Apostasy: External Causes Considered. Causes of the apostasy, external and internal. — Persecution as an external cause. — Judaism and Paganism arrayed against the Church. — Judaistic persecution. — Predictions of Judaistic opposition. — Fulfilment of the same. — Destruction of Jerusalem. Causes of the Apostasy: External Causes, continued. Pagan persecution. — Roman opposition to Christianity, explanation of. — Number of persecutions by the Romans. — Persecution under Nero. — Under Domitian. — Under Trajan. — Under Marcus Aurelius. — Later persecutions. — Persecution under Diocletian. — Extent of the Diocletian persecution. — Diocletian boast that Christianity was extinct. — The Church taken under state protection by Constantine the Great. Causes of the Apostasy: Internal Causes. Diverse effect of persecution. — Imprudent zeal of some. — Return to idolatry by others. — “Libels” attesting individual apostasy. — Sad condition of the Church in third century. — Testimony as to conditions of apostasy at this period. — Decline of the Church antedates the conversion of Constantine. — Departure from Christianity. — Specific causes of the growing apostasy. Internal Causes, continued. First specific cause: “The corrupting of the simple principles of the gospel by the admixture of the so-called philosophic systems of the times.” — Judaistic perversions. — Admixture of Gnosticism with Christianity. — Gnosticism unsatisfying. — New Platonics. — Doctrine of the Legos. — “The Word.” — Sibellianism. — Arianism. — The Council of Nice and its denunciation of Arianism. — The Nicene Creed. — The Creed of Athanasius. — Perverted view of life. — Disregard for truth. Internal Causes, continued. Second specific cause: “Unauthorized additions to the ceremonies of the Church, and the introduction of vital changes in essential ordinances.” — Simplicity of early form of worship ridiculed. — Formalism and superstition increase. — Adoration of images, etc. — Changes in baptismal ordinance. — Time of its administration restricted. — Ministrations of the exorcist introduced. — Immersion substituted by sprinkling. — Infant baptism introduced. — Changes in the sacrament of the Lord’s Supper. — Fallacy of transubstantiation. — Adoration of the “host.”— Proof of apostate condition of the Church. Internal Causes, continued. Third specific cause: “Unauthorized changes in church organization and government.” — Early form of church government. — Equality of the bishops. — Origin of synods or church councils. — Bishops of Rome claimed supremacy. — Title of Pope assumed. — Secular authority asserted by the pope. — Indulgences or pardons. — Infamous doctrine of superogation. — The traffic in indulgences. — Tetzel the papal agent. — Copy of an indulgence. — The sin of blasphemy. — Scripture-reading forbidden to the people. — Draper’s arraignment of the papacy. Results of the Apostasy: Its Sequel. Revolts against the Church of Rome. — John Wickliffe in England. — John Huss and Jerome of Prague. — The Reformation inaugurated. — Martin Luther, his revolt; his excommunication; his defense at Worms. — The Protestants. — Zwingle and Calvin. — The Inquisition. — Zeal of the reformers. — Rise of the Church of England. — Divine over-ruling in the events of the Reformation. — The “Mother Church” apostate. — Fallacy of assuming human origin of divine authority. — Priestly orders of Church of England declared invalid by the “Mother Church.” — The apostasy admitted and affirmed. — Wesley’s testimony. — Declaration by Church of England. — Divine declaration of the apostasy. — The sequel. — The Revelator’ vision of the Restoration. — The Church re-established in the nineteenth century.